InfoStats2 (Download Here) NOT THE ONE IN BIGBOSS! Stop, just stop here for one second. I’ve gotten this many many times. People are saying that InfoStats2 causes safemode, and they are right. The thing is you see that link right next to InfoStats2? Thats the link you should use. That’s why I put it here. Please use it and you won’t have issues. Note: WebCycript is a modified deb that allows installation on iOS9 until Saurik updates. You can install the deb from iFile. Note2: If you purchased LockHTML4 you can install on 9.3.3 if not you will need to wait until Saurik allows devs to update their packages. For the springboard you will need to install DockAdjust, NoPageDot7, iWidgets, Cycript, WebCycript, Win10, and InfoStats2. Clear the first page of your homescreen, do this by moving all icons to page two. You can also move your dock icons to page two. Install DockAdjust, and NoPageDots7. Tap and hold on the springboard and select the Win10 iWidget (when selected you will have options to adjust). Springboard is now setup. Go to LockHTML in settings, choose the option Select Widget, choose Lock+, just below that is Widget Position set that to Above Notifications and Enable HTML. 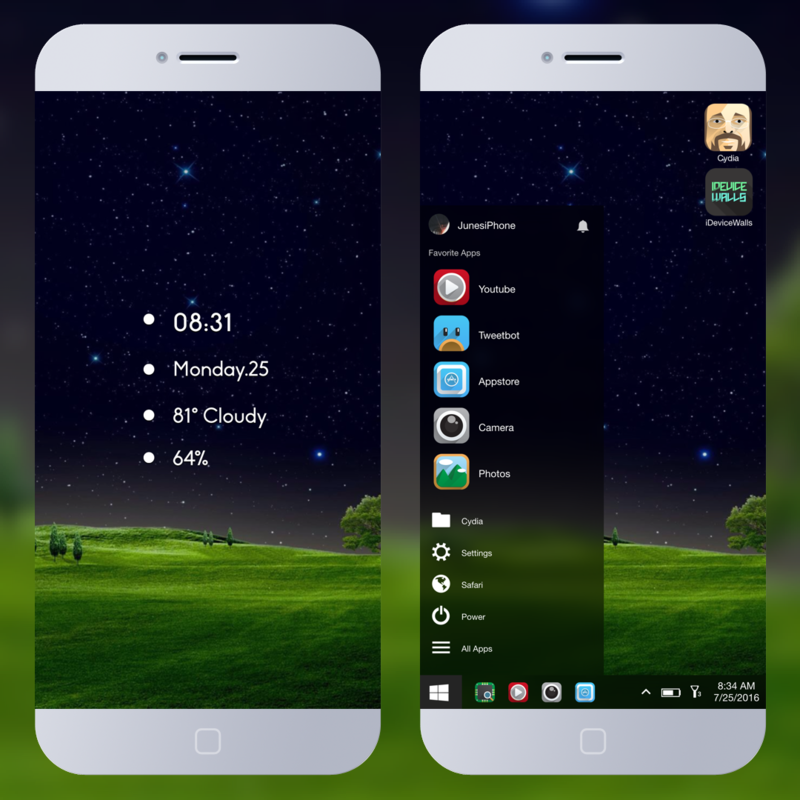 Once on the lockscreen swipe left and choose view themes, select the theme shown.